Mensusa https://www.mensusa.com/articles/mens-solid-dress-shirt-with-matching-tie.html Gentlemen, It's Time For A Makeover-Mens Solid Dress Shirt With Matching Tie Mens solid dress shirt with matching tie-time to strut your way down your street and enMens Solid Dress Shirt With Matching Tiejoy the appreciation for all the effort you put in to look like the prized personality you are. 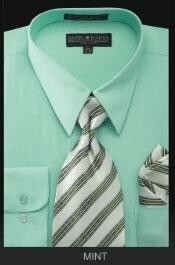 Mens solid dress shirt with matching tie why would you go for this impeccable combination? A gratifying sight indeed, is to behold a man in a well-fitted solid dress shirt with a matching tie that wraps up his entire persona. Think only the ladies of our species do the preening and gloating when it comes to looks? Ah, not quite so! There are men out there who take extreme satisfaction in not just looking good, but dressing good! But let's face it. Men generally abhor the dreaded activity of shopping, much to the chagrin of many annoyed girlfriends, fiances and wives. Still want to dress to impress though? Read on whilst you moisturize and condition that mannish beard, as we make you all shirt-savvy! Patterns are always tricky, and you can never be quite sure if those stripes look flattering or catastrophic on you. What does a guy have to do for hitting the jackpot in the limited attention he can spare for shopping? Here's what you can do: minimalist, match and masquerade! Yes! The sure-fire way to finding the right look for your frame without compensating on comfort is to follow these 3 steps- and you'll be guaranteed with a smashing outfit to saunter around in. Start off with a color that you feel right to drape over your frame. Choose warm hues if it is winter and go for cool tones if it is summer. Open up www.mensusa.com homepage and start cruising along the endless options they have. Or if you prefer, go to your favorite store and ask that friendly smiley faced guy for assistance. All the more better if you tell him your choice of color, fit and cut. Then be led to a plethora of loaded options to choose from! It is easy to feel overwhelmed by stacks and stacks of vibgyor fabrics and palettes. Be spontaneous! Pick up five shades of what instantly appeals to you and throw the shilly-shallying to the winds- you never know how that maroon shirt will look on your body if you don't put it on first! Be fad-savvy but don't be scared to invest in classics. In the end, you are your own clotheshorse and if something looks good on you, no one can tell you not to wear it. What's a smashing men's solid dress shirt without a matching tie to go with it? 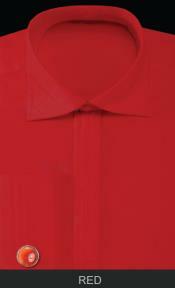 A tie to a shirt is a gem to gold chain- doesn't take away anything but only adds heaps and heaps to the grandeur! Contrasting colors- team up a solid azure shirt with an ivory tie. Subtle mingle- got a plain pink shirt? Top it up with an affluent lavender tie. The rule of thumb with this approach is to pick colors from the same family. Pattern on solid- Ah, the most interesting of the bunch! Top off your solid dress shirt with a patterned tie that has at least a color in common. Woo! You did it, mister! Wasn't too hard now, was it? Well, it's time you strut your way down your street and enjoy the appreciation for all the effort you put in to look like the prized personality you are.